We’ve known for some time that EngageNY, an online repository of open educational materials, has a magnetic quality for many of the nation’s educators, millions of whom have downloaded its resources for use in their schools. A new report by the Rand Corporation offers some specifics on why teachers’ appetites for the English/language arts and math resources are so strong. The materials housed on EngageNY are aligned to the Common Core State Standards and were created as “open” education resources, meaning they are free to users and can be shared and altered as educators want. The site, created by the state of New York, has drawn more than 17 million users and has had 66 million downloads since its resources went online in 2011, according to the most recent numbers from New York’s education department, as my colleague Liana Heitin reports. The Rand report says that 30 percent of math teachers and more than 25 percent of English/language arts teachers nationally are using the EngageNY in some way. The numbers were higher in individual states that are using the common core and similar standards, according to Rand. The curriculum is accessed by teachers in every state, but educators in states that have adopted the Common Core State Standards or similar standards are 65 percent more likely to use EngageNY than are their peers in non–Common Core states. Despite the openly licensed nature of EngageNY, teachers did not say that the”availability” of the materials was an especially big influence in why they choose them. Other factors, such as the influence of the district’s curriculum guidelines, mattered more. Among a subset of teachers–those who indicated that EngageNY was one of the top three instructional materials they use–more than three-quarters said that their district either recommended or required them to use at least some of the New York materials. 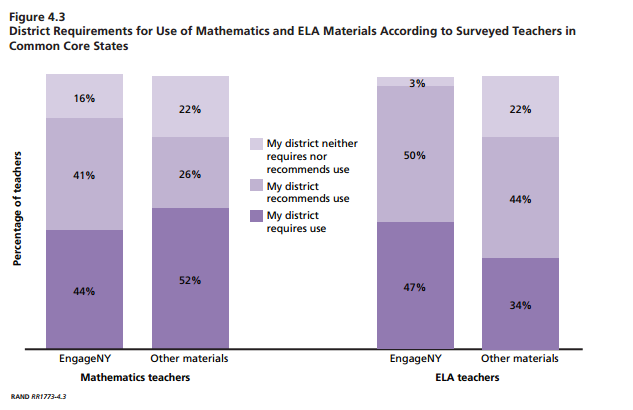 A slightly higher portion of teachers using ELA said their districts compelled them to do so. The report draws from different data sources collected during the 2014-15 and 2015-16 school years. The data include prior surveys of teachers conducted by Rand as part of the American Teacher Panel, as well as Google Analytics reports provided by the New York state education department. For a deeper look at changing district demands for open resources, stay tuned for an Education Week special report on curriculum being released this week. How can I get a list of school districts that have adopted Engage NY math and ELA ?